Join us on March 29, 2018, at 7:00pm ET for a discussion on the live-action film version of A Wrinkle in Time, directed by Ava DuVernay based on a screenplay adaptation by Jennifer Lee. Join us on March 29, 2018, at 7:00pm ET for a discussion on the live-action film version of A Wrinkle in Time, directed by Ava DuVernay based on a screenplay adaptation by Jennifer Lee. The movie stars Storm Reid, Oprah Winfrey, Reese Witherspoon, and Mindy Kaling. The film’s story follows the adventures of Meg Murray as she seeks to find her father, whom she learns is being held captive on a distant planet. Meg enlists the help of her brother Charles, her classmate Calvin, and three mysterious women known as Mrs. Which, Mrs. Whatsit and Mrs. Who. For this discussion, we are adding three first-time Movie Club panelists who are passionate about the story of A Wrinkle in Time: Sparrow Alden, Sharon Hoff and Kay ben-Avraham. Each brings a unique perspective to the discussion, and there will likely be a lot of comparison to the original novel. We may even have some conversation around the 2003 TV movie adaptation produced by Disney. Sparrow Alden was graduated from Bowdoin College in 1986 with a BA in English Literature and Psychology and from Signum University in 2015 with an MA in Language and Literature. She is co-owner/builder of a straw bale cabin in the New Hampshire woods with her wife Grace and their teen children; she is an adjunct professor of English at the River Valley Community College and has been a credentialed religious educator for the past twenty years. As an independent scholar, Sparrow takes a digital humanities perspective into the works of J. R. R. Tolkien through her blog, Words That You Were Saying. As an amateur writer, she delves into poetic meditations and prose fantasy narratives. As a professional religious educator, she is the author of a good handful of children’s curricula on Earth-Centered spirituality. Sharon Hoff is the Doorward and Outreach Director for Signum University. She holds a BS in Child Development and spent the early part of her working career with pre-schoolers. Kay ben-Avraham studied English Literature, as one does when one is overly given to bookishness, and graduated with her B.A. from Messiah College in 2008. She runs a freelance writing and editing business at forwantofanail.net, takes Master’s classes with Signum, and is pursuing publication for her first novel, The Flower of the Cedar. Her copies of nearly every Madeleine book ever written bear the markings of eager teenage marginalia and will collect more with each passing year, world without end, amen. Curtis Weyant is a Signum Grad School alumnus who never read A Wrinkle in Time, but nonetheless thinks he can keep up with the other panelists in a discussion about the film. A digital marketer by trade, he co-hosts the weekly podcast Kat & Curt’s TV Re-View and enjoys cooking as a hobby – where he sometimes adds a sprinkle of thyme. Kat Sas holds an MA in Language & Literature from Signum University, where she concentrated in Imaginative Literature. She hosts a weekly podcast on speculative television at Kat & Curt’s TV Re-View, and she blogs about Doctor Who, Game of Thrones, and other shows on her blog, Raving Sanity. 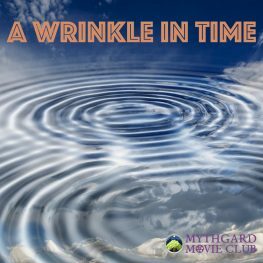 Join us on March 29, 2018, for a Mythgard Movie Club panel on A Wrinkle in Time. Signum University is 501(c)(3) nonprofit educational institution dedicated to making affordable online education available to all. Get updates about classes, programs and events!